Mumbai’s Finest has been making Rap and Hip Hop Music Independently Since 2006. Considered by many as India’s Best Rap Crew, they never fail to deliver. Ace aka 39, the crews founder and lead emcee, has just dropped his latest project featuring Dj Su Real. Beta Baap Aaye is an official collab between Ace aka 39 from Mumbai’s Finest, Mumbai and Dj Su Real from New Delhi. It is a genre bender hip hop track that mixes the traditional tabla with an electronic sound. Ace aka 39 talks about the mumbai mindstate and the kinda position and authority he holds in the city. The Video is shot at Qyuki Music, Bandra and also features Kinga Rhymes and MTV Splitsvilla 7 Contestant, Rosemary Fernandes. “I wanted to make a flashy 90’s style video”, says Ace aka 39. The video has been shot on a croma green screen and it has a wicked storyline attached to it. The video even sports 3d graphics and a custom designed Impala . This is Mumbai’s Finest ‘s first project with Qyuki Music, which is AR Rahman and Shekhar Kapur’s Artist and Music Management company. Two of the giants in the underground hiphop scene collaborate, as they bring out this video. JB from Nau Sau Bai, and Pardhaan from Desi Beam drop the promo for their upcoming video “Keda Ni Jaanda”. The track is from “Breakout- The biggest Indian mixtape”. The video has been shot & directed by Sandy Goswami. Watch out for the full video, and exclusive behind the scenes footage, only on DRS TV. The 6th Release From MC Heam’s Mixtape “Veda Astra” Is Now Available Worldwide Over YouTube. Titled As :Haar Ke Pal” ft. Charlie Slum From Pittsburgh. The Titled Explains It All. Check It Out! Slumgods & DRS Presents : Kru172 , Desi Beam Along With Mandeep Sethi At The 5,6,7 Club On The 31st March. 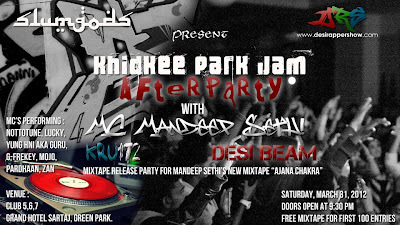 Mandeep Sethi & Slumgods Live at Khidkee Park Jam Afterparty, for the launch party of Mandeep Sethi’s Brand New Mixtape “Ajna Chakra”. Also performing are MC’s from Chandigarh, Desi Beam & Kru172, Alongside Zan from 2Shadez. 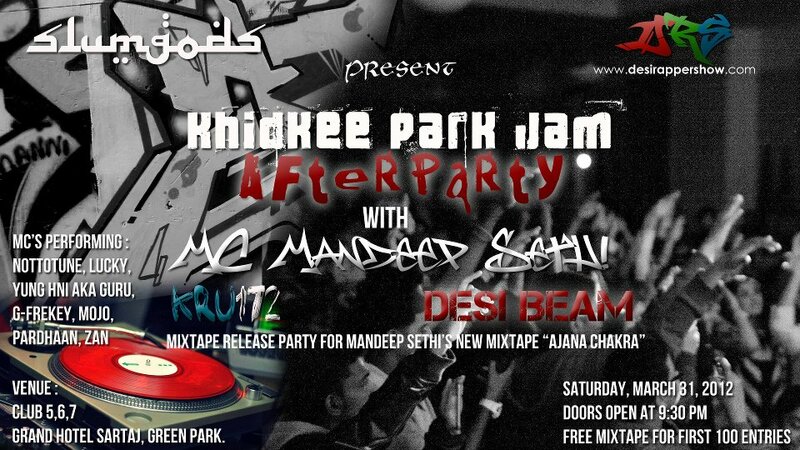 The First 100 Entries Will Get Mandeep Sethi’s Brand New Mixtape “AJNA CHAKRA. The DRS crew was there for an exclusive coverage of the show. 922 performed many of their hit singles, as well as some fresh tracks from their upcoming projects.